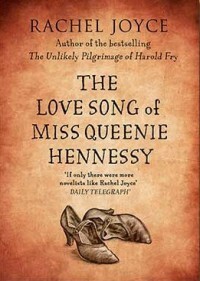 Neither a sequel or a prequel to Harold Fry, The Love Song of Queenie Hennessy is instead written from her side of the story rather than Harold's. For me this was the better book, I liked Harold Fry but this one had something more. I loved the parts that were relating events that happened in the hospice. I could laugh at parts of it and feel emotional at others. I had forgotten some of the first novel but it didn't really matter, both books do work well on their own. The ending left me feeling devastated. I knew what the outcome was but parts of it I hadn't expected. Will be interested in further novels by Rachel Joyce.